White silk and wool mixed organdy with print; double-tiered skirt with border pattern; pagoda sleeves with fringe. This type of widely protruding skirt that appeared around the middle of the 19th century came to be known later under the name of the "crinoline style." As can be seen with this dress, large design motifs proved immensely effective on these voluminous skirts. The border pattern here is wood-block printed and repeats every 20.6 cm. Compared to small-scale designs, large patterns require a solid technique to avoid misalignment of the print colors. 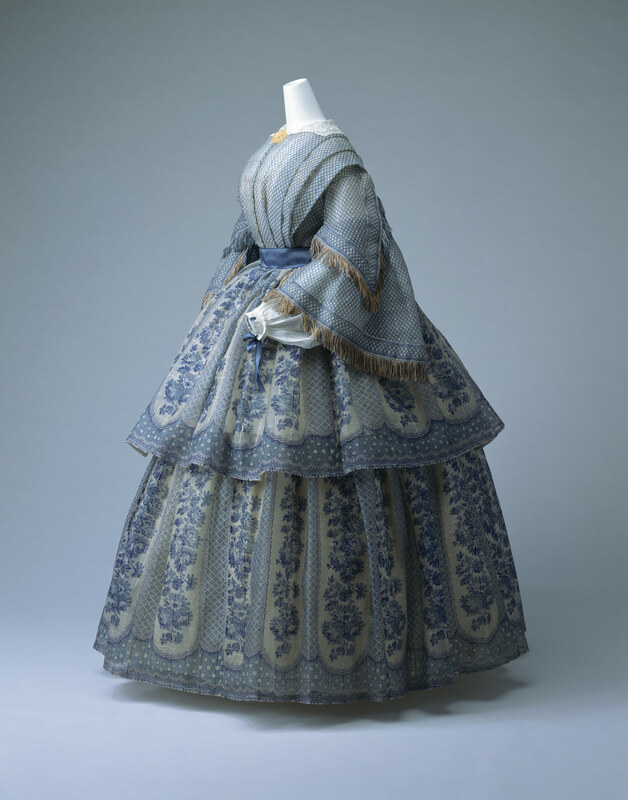 Considering that this mixed fabric of silk and wool is a material hard to print on, this dress with its bright and cheerful colors is a particularly fine example on how much cloth printing techniques had evolved.